RUBEN GRACIANI is a choreographer, master teacher, and arts administration leader. He is currently the Director of the School of Theatre and Dance at James Madison University. He was previously the Chair and Associate Artistic Director of the Department of Dance - Conservatory of Performing Arts at Point Park University. He has served on the Dance Panel of the New York State Council of the Arts and currently serves on the Nominating Committee of the National Dance Museum – Dance Hall of Fame. In 2016, Mr. Graciani was selected as an adjudicator for the American College Dance Association Northeast Conference. Recent commissions include, Broadway Dance Center's Pro Sem Showcase, the Great Lakes Dance Festival, and works for the Conservatory Dance Company at Point Park University. Recently, he premiered Tethers, Capsules and Collisions, in collaboration with composer Alex Marthaler and an evening length work, FIVE, in collaboration with choreographer Kiesha Lalama and the Bach Choir of Pittsburgh. In 2009, he formed RG DANCE PROJECTS. The company has performed in 2013, 2014, 2015 and 2017 engagements at Joe’s Pub for the Dance Now Festival and has received Joe´s Pub´s Audience Favorite Award, which resulted a residency at DanceNow SILO in Pennsylvania. RG DANCE PROJECTS was shown dance for camera work at the Current Sessions Festival in New York City, in addition to performing at the Steel Stacks Performing Arts Center in Bethlehem, PA, CoolNY Festival, historic Martha Graham Contemporary Dance Theater at Westbeth, Saratoga ArtsFest, and at the DanceNow Raw Materials festival. Moreover, the company has cemented their commitment to collaborative project, including work at the Tang Teaching Museum, the International Woodwind Festival with pianist Luke Frazier and clarinetist Cynthia Doggett, and with Ensemble Connect (formerly Ensemble ACJW) on a production of Stravinsky's, L’Histoire du Soldat . 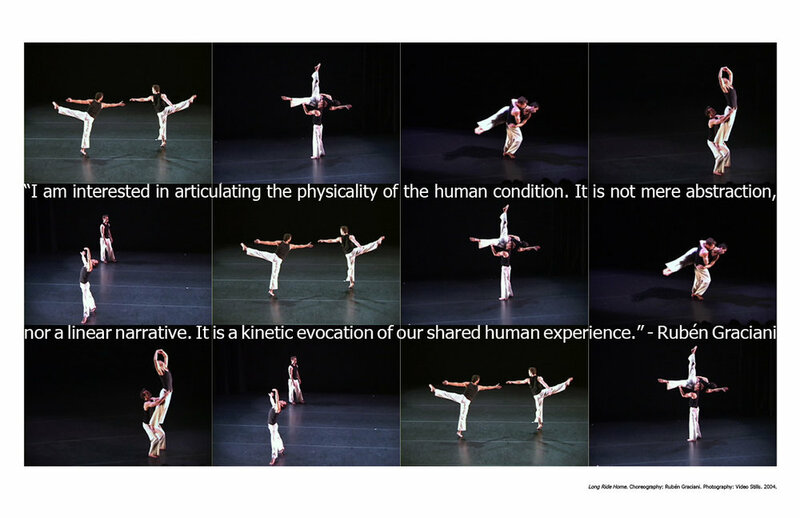 Mr. Graciani joined the faculty of Skidmore College in 2008, where his dance film projects with students was profiled in Dance Magazine´s November 2012 edition. While at Skidmore, he collaborated with renowned composer Richard Danielpour and pianist, Xiayin Wang on the work Swing and a Miss, which premiered at Skidmore College’s Zankel Music Center. In addition, Mr. Graciani presented a show of solo works at the SAS Performing Arts Center in Shanghai, China and premiered three works for Saratoga ArtsFest, including an evening of his own work. He has performed nationally and internationally with the Mark Morris Dance Group, the Kevin Wynn Collection, CityDance (guest artist), Company Stefanie Batten Bland, Brian Brooks Moving Company (guest artist), and the Joe Goode Performance Group. While working with the Joe Goode Performance Group for two seasons, Mr. Graciani contributed to the creation and premiere of new work at the company’s home season in San Francisco, two national tours of new work and repertory, a site-specific performance at San Francisco’s Grace Cathedral, and teaching master classes all over the country. In the fall of 2005, Mr. Graciani joined the faculty at Ohio University as an Assistant Professor. While there, he received two Arts for Ohio Choreographic Grants, one of which resulted in the collaboration, Oyster, with composer John Orfe and the Grammy Award winning new music ensemble, Alarm Will Sound. Mr. Graciani began his artistic career as a scholarship student at the North Carolina School of the Arts and at The Juilliard School. After working with major New York dance companies such as the Martha Graham Dance Company and the Merce Cunningham Dance Company, he went on to complete a B.F.A in Dance at the State University of New York – Purchase College. While at Purchase, Mr. Graciani was invited to perform in three International Festivals of Dance staged in Taiwan and China and to join the New York based company, Kevin Wynn Collection. After ten years as a member of the New York City dance community, Mr. Graciani began graduate school at the University of Maryland – College Park. His M.F.A. thesis concert, Search for my Familiar, was performed to critical acclaim. A few of Ruben Graciani's past and present projects. Leader of a School of Theatre, Dance and Musical Theatre which is embedded in a vibrant and engaged liberal arts tradition. The programs in the School of Theatre and Dance at JMU are a blend of liberal arts education and critical thinking with intensive pre-professional training and practice. Leading in all aspects of arts administration, curriculum revision and development, vision/mission, change agency, faculty and student support, artistic direction, budget & finance, and strategic planning. Leader of one of the largest and most complex dance department's in the country. The programs in dance at Point Park are consistently rated in the "top 5" of the country.